‘Schavuit‘ can be translated as ‘Coquin‘ in French or ‘Mischievous‘ in English. It’s a very nice name when we think to the attention she is requiring from her owners whom restored her and maintained her in good state since so many years to keep her alive. In the past, she was named ‘Koophandel’, ‘Vrouwe Jesje’, ‘Cui Bono’ and ‘Schavuit van ‘t waterland’. Electrical system : battery charger, inverter 1.2 kW, etc. The Schavuit was built in puddle iron, the metal used by Gustave Eiffel to build the Tour Eiffel in Paris (1887, the same year than the Schavuit) and the Statue of Liberty in New York (1886). During the industrial revolution, puddle iron was obtained from cast iron by a special oxidation process to remove its charcoal content. It was invented by Henry Cort at Fontley in Hampshire (1783–1784). It is an intermediate state between the cast iron and the high quality carbon steels that we know today. It allows an easy warm riveting, but its heterogeneous structure can make it fragile if it stressed in a wrong direction. 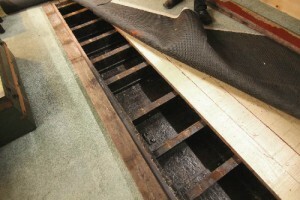 Today, welded repairs of puddle iron structures are requiring the use of special welding rods and specialized workers. 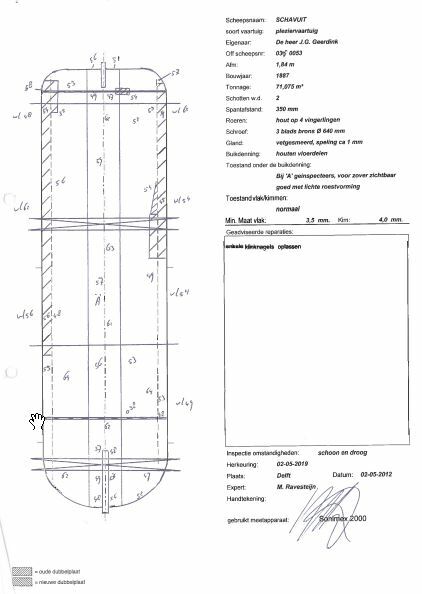 The 5 years regular hull thickness control of 2012 (see picture) is showing that only a few repairs have been made on the lowest sides of the ship. This is a wonderful state for a 125 years old ship ! Fortunately, the ship was transporting mainly turf, which is a smooth and light product. It did not deform the hull as stones or other dense or rough matters would do. Today, the hull is just as plane as the first day of her construction. 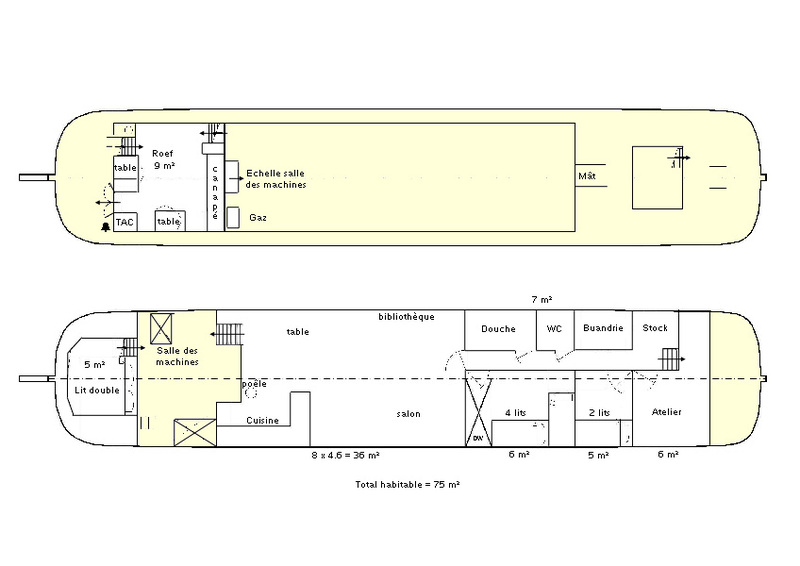 85 m² inhabitable area : roof (at deck level), living area with kitchen, cabins, shower, washing machines, workshop, etc. 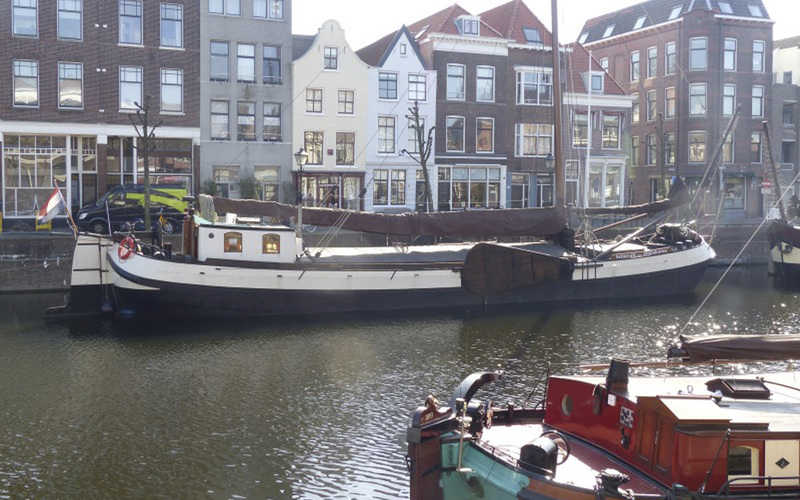 The Schavuit is registered as a first category historical ship. 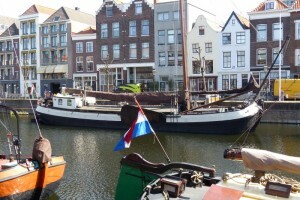 She is the oldest zeetjalk in navigation state under sail. If we include other types of ships, not many are older than her ! The historical status allows the ship to get a permanent mooring in a Museum harbour, with some constraints for the owner. She must of course be very well maintained. A restoration process must also be activated so that her visible parts (from outside) tend to look like they were in the past. The period used as reference for the restoration of the Schavuit is 1933-1938, after her wooden roof was rebuilt in steel. Today (2015), this objective is achieved at more than 90%. The restoration of old ships depend on a compromise which can be resumed by a simple question : as a perfect restoration makes impossible to use the ships for modern activities, who will restore and maintain hundreds of ships ? 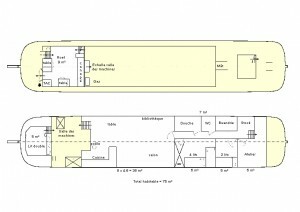 The engine room entrance and the propane gas reserve should disappear at the front of the roof. A compromise must be found for the chimneys and the portholes which are necessary to live on board. In the past, the chimneys were maybe less visible and there were no window into the hold. The central window at the back of the roof must be removed. 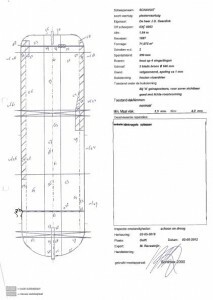 There is a discussion about the height of the roof, the dimensions of the lateral windows of the roof and their eventual shutter boards (tjalks have normally shutter boards, but the schavuit got none in the past). Another compromise must be found about the steering. In the past, it was a tiller which is not the most powerful steering system if we consider the requirements of modern navigation.